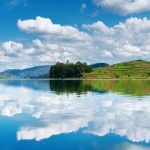 Depending on the time of your arrival, you may as well take a night in either Entebbe or Kampala as planning to leave for Kibale Forest National Park the following Day. Today you will experience some serious monkey business! Kibale Forest National Park boasts the highest number of primate species in the world, including the chimpanzees. Approximately 5,000 chimpanzees live in the wild in Uganda, which makes it a perfect place to spot them! In the early morning, you will go with an experienced ranger for chimp tracking; you might also see other monkey species that live here. Once you locate the chimpanzees you will have a full hour of eye-to-eye contact with them. Since they are wild animals, we can never guarantee you to see them and might have to settle with hearing their hoots and hollers. Your swamp walk (2-3 hours) will take you through grassland, small communities and some beautiful scenery, where the locals are likely to greet you with enthusiastic waves. It is usual to spot three to four different primate species during this walk, though the highlight is catching a glimpse of the great blue turaco! At an additional fee of only $70 us dollar per person, you do the chimpanzee habituation tracking instead of the regular chimpanzee tracking. This will take all day and you will be 100% sure to have a very close encounter with your closest relatives. Book this in time because only 6 persons per day are allowed to go. Your swamp walk can be postponed to the next morning. After an early breakfast at your lodge, you will then continue your journey to Queen Elizabeth National Park. Queen Elizabeth National Park is Uganda’s second largest park, located at the base of the majestic Rwenzori Mountain range, adjacent to Lake Edward and Lake George. The park has a prolific game, including Gazelle, Uganda Kob, Warthog and Waterbuck. In the afternoon you will take a boat safari along the Kazinga Channel which joins Lake George and Lake Albert. Here, you will see a lot of hippos (more than you can possibly imagine! ), as well as a variety of other animals which come to the waterhole to drink or bathe. You can expect to see buffalo, crocodile, bathing elephant, and a range of beautiful birds. This will undoubtedly be one of the highlights of your tour. Today you wake up early and you will go for your first game drive in Queen Elizabeth NP. Queen Elizabeth is Uganda’s second largest park, located at the base of the majestic Rwenzori Mountain range, adjacent to Lake Edward and Lake George. The park has a prolific game, including gazelle, Uganda kob, warthog and waterbuck. Lions are often sighted both in and at the entrance to the park. Be prepared for huge numbers of hippo and elephant, and keep your eyes peeled for a leopard lazing in the sunshine. You will take off early at dawn for a flight that lasts for approximately 1 hour. Rise as the sun rises and floats in whatever direction the winds of the morning takes you. Fly higher than the trees and hills and enjoy the best of Uganda, with many great photo opportunities of the scenery and wildlife below. 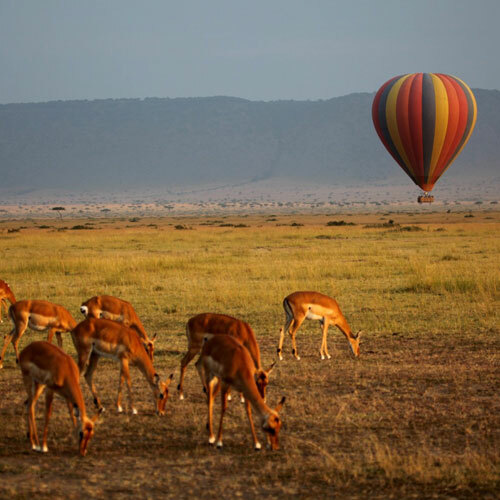 After a smooth landing, you can celebrate this amazing adventure with a glass of sparkling juice before returning to your lodge to continue your safari. For visitors who yearn to get up close to wild African fauna, a research trip is a rewarding adventure. This new and unique experience allows visitors to actively participate in monitoring some of the lions in the park, using locator devices and learn habituation calls, as well as monitoring weather, surroundings and behaviour. The results are added to researchers’ databases, contributing valuable information to the overall understanding of wildlife ecology – and helping to conserve this wonderful ecosystem. This will as well gives you a 95% chance to see the lions! 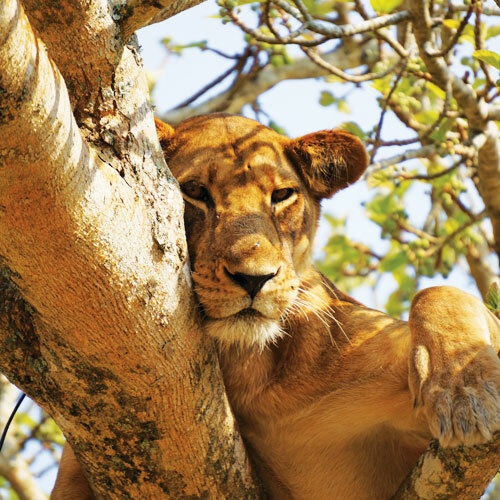 For visitors who yearn to get up close to wild African fauna, a research trip is a rewarding adventure. This new and unique experience allows visitors to actively participate in monitoring some of the exotic birds and mammals that fill the park, using locator devices and learn habituation calls, as well as monitoring weather, surroundings and behaviour. The results are added to researchers’ databases, contributing valuable information to the overall understanding of wildlife ecology – and helping to conserve this wonderful ecosystem. Experiential tours last between one and three hours. They usually take place in the early morning or evening, or occasionally at night. All activities must be booked through the Visitor Information Centre in Mweya at least 24 hours in advance. Today you drive to Bwindi Forest National Park in the south-western part of Uganda You cross a beautiful part of the country often referred to as ‘the Switzerland of Africa’. 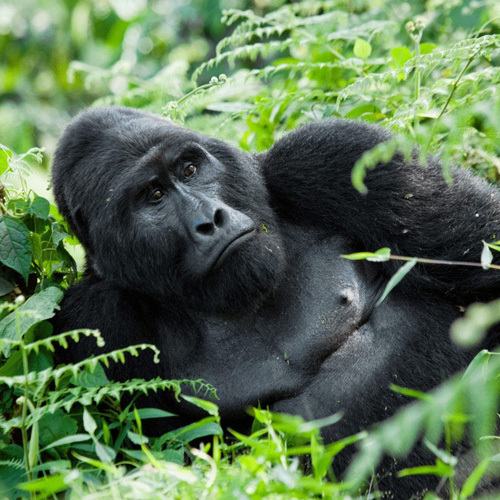 Today is the big day for gorilla trekking, meet Uganda’s gentle giant! For most people, this is the absolute highlight of their tour in Uganda. 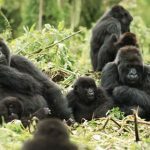 The gorillas you track belong to one of nine habituated family groups who can tolerate the presence of humans for a brief period every day. Bwindi Impenetrable Forest boasts both mountain gorillas and chimpanzees – the only forest in Africa which can make this claim. It also hosts five other species of primate, 113 species of mammal, over 200 butterflies and 360 birds. En route, your guide will point out signs of previous gorilla activity, including dung, nests and chewed bamboo shoots. 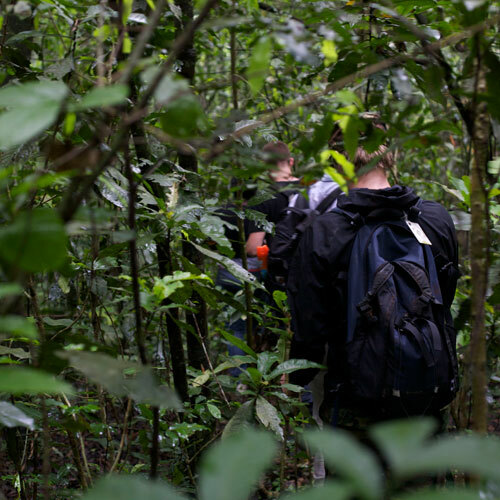 Your track will be an exciting journey along forested slopes, entwined vines, bushes and bamboo before you eventually reach the gorilla family. After your morning activity, your driver/ guide will drive back to Kampala or Entebbe (Airport) stopping at the equator for the requisite snapshot and a bit of souvenir shopping.